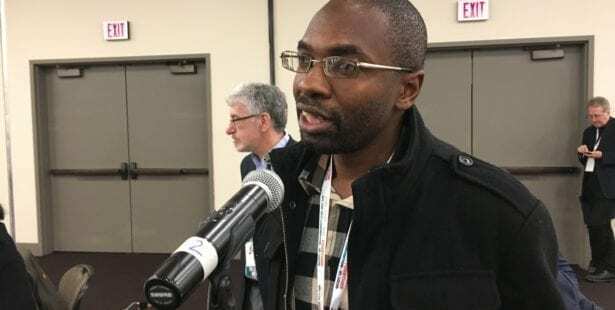 Mutasa discussed Zimbabwe’s economic crisis and unions’ efforts to support working people during a discussion on the recent Working Life podcast. Some 95 percent of Zimbabwe’s workers eke out a living in the informal economy, with between 70 percent and 80 percent of people struggling to get by on less than $1 per day. Workers’ share of income has steadily declined since the country became part of the World Bank and International Monetary Fund’s structural adjustment programs in the 1990s, says Mutasa. Mutasa has been involved in union building since he graduated high school in 1997 and took his first job as a bank teller. Surprised and disheartened to find that conditions were not what he had expected, such as no lunch break and overtime pay, Mutasa met with a member of a union who talked with him about his rights as a worker, launching his union activism.